Israeli Prime Minister Benjamin Netanyahu shakes hands with Palestinian President Mahmoud Abbas during the funeral of former Israeli President Shimon Peres in Jerusalem, September 30, 2016. Photo: Amos Ben Gershom/Government Press Office (GPO)/Handout via REUTERS. President Donald Trump’s Middle East envoys reportedly proposed the idea of establishing a confederation between Jordan and the Palestinian territories in a meeting with Palestinian Authority President Mahmoud Abbas. According to Israel’s Channel 10, Abbas revealed the proposal to visiting opposition MKs Ksenia Svetlova and Moshe Raz. Abbas told them Trump’s envoys Jared Kushner and Jason Greenblatt asked him if he would agree to the union with Jordan rather than an independent Palestinian state. 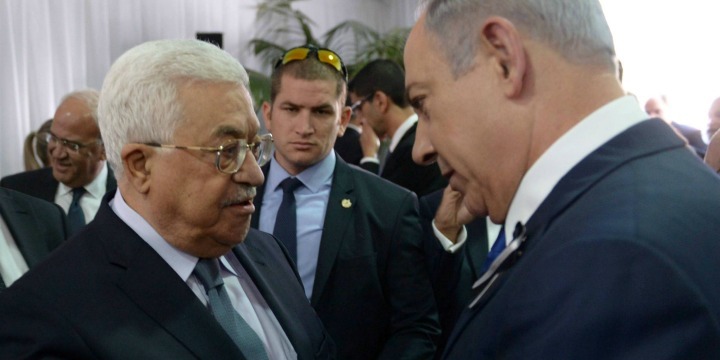 Abbas responded by asking whether such a confederation could also include Israel. Greenblatt and Kushner reportedly said that they did not have an answer. The idea of a confederation with Jordan as a replacement for the two-state solution is not new, but by and large has not been taken particularly seriously.